In examining the 7,000-year continuous genetic record in sediments underlying the Black Sea, Coolen discovered that the DNA of both the Coccolithovirus and its host, Emiliania huxleyi, a phytoplankton that plays a major role in the global carbon cycle, have been preserved over thousands of years. “Biologists now for the first time have a picture of long-term viral/host dynamics in the ocean,” Coolen said. Previous laboratory work had confirmed such co-existence for only a few successive years. The latter question is of particular interest, Coolen said, because “nobody has long-term records of viruses. Ecological shifts in past algal communities are generally explained by changes in climate and environmental conditions.” Now it seems possible, he said, that viruses also played an important role in shaping past algal communities. This is important for E. huxleyi, which performs photosynthesis—“just like plants,” says WHOI scientist Benjamin Van Mooy. “They consume carbon dioxide.” In doing so, they reduce the amount of CO2 released into the atmosphere. They form a calcium carbonate shell, also helping to regulate the carbon cycle. Coolen says his data buttress Van Mooy’s work by suggesting a significant role for viruses in affecting the algal population and carbon cycling in the past. He observed, for example, major shifts in the types of Coccolithovirus and E. huxleyi in the Black Sea sediments over the centuries. Environmental conditions almost certainly had a role in selecting successful E. huxleyi genotypes, but Coolen believes viruses may have as well. One thing that enabled Coolen to study sediments so far back in time was the continuous absence of oxygen in the bottom waters of the Black Sea the last 7,500 years. “This lack of oxygen facilitated the preservation of organic material in general and ancient viral and algal plankton DNA in particular,” he said. 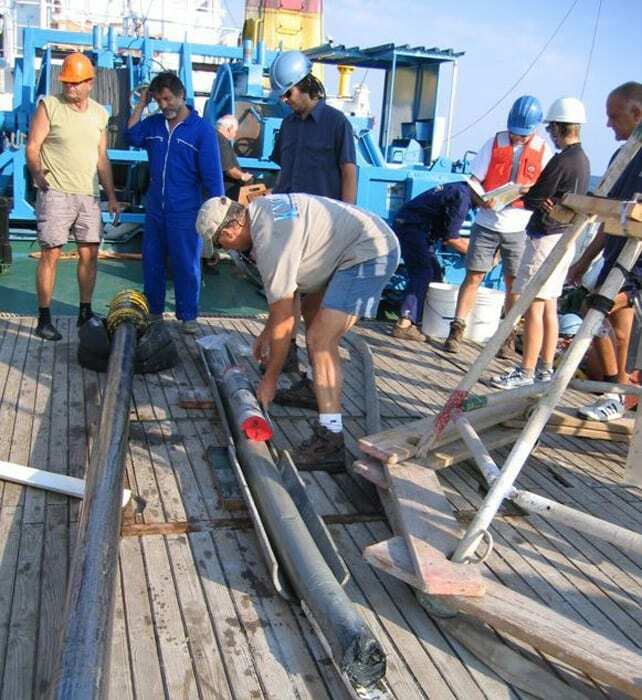 In addition, unpublished data from Coolen’s lab “show that Black Sea sediments older than 7,500 years contain well-preserved DNA of a different suite of algae adapted to lower salinities and freshwater environments and likely also DNA of their viral pathogens,” he said. “In other words, comparable studies could most likely be employed in a wide variety of marine and lake ecosystems. The research was funded by grants from the National Science Foundation (NSF) and a grant from the Andrew W. Mellon Foundation. The giant gravity core just after being removed from the core barrel. The sediments were captured inside a plastic liner (“sausage core”) during coring. 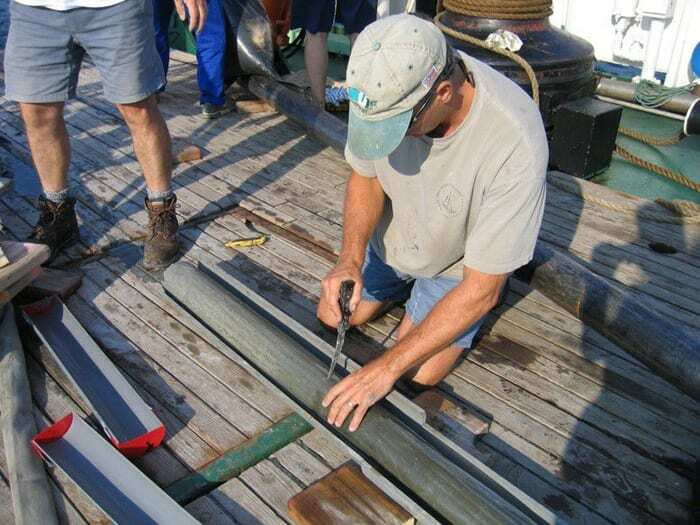 WHOI Research Specialist Alan Gagnon prepares core sections for aseptic sampling. At this point, the sediment core was protected by a thin plastic liner against contamination with foreign DNA. 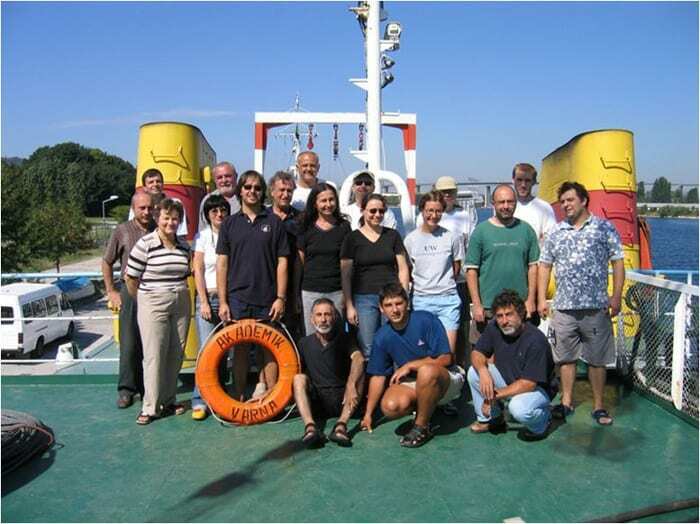 Marco Coolen (holding the ) and researchers from WHOI and the Institute of Oceanology, Bulgarian Academy of Sciences (IO-BAS) on board of the R/V Akademik.